Today’s buying environment is increasingly complex. Nonetheless, sales leaders are expected to boost revenue and customer loyalty — all while closing more deals than ever before. We’ll help you build a sales function for the future. This is truly a partnership without a doubt. Pressure is mounting on sales leaders to drive growth through new and existing customers, and B2B purchase experiences, regardless of their complexities. We provide you with the insights, advice and tools you need to address your mission-critical priorities. The ready availability of quality information through digital channels has made it far easier for buyers to gather information independently, only engaging sellers when absolutely necessary. We can help you maximize the impact of the few opportunities your sellers do get with customers. Despite a 2.3x increase in sales teams’ product portfolios, cross-sale and account growth efforts are stalling. In fact, traditional account management models may actually stunt growth. We can help you unlock potential in your accounts by applying new account management models. Today’s dynamic work environment demands managers play a much larger role in employee development. We can help you develop managers with the coaching behaviors that drive seller performance. Customers are quick to set minimum requirements, shortlist vendors able to meet those criteria and force a price-based discussion. We can help you respond to these conditions with strategies that offset them. The increasing scope of job responsibilities in today’s work environment is overburdening sellers, and many organizations’ efforts to alleviate the problem are only making it worse. We can help you optimize your sales support to boost productivity. What are the bold moves sales leaders should be making now? Where should they be skewing their resources to “swim with” the changes they face? 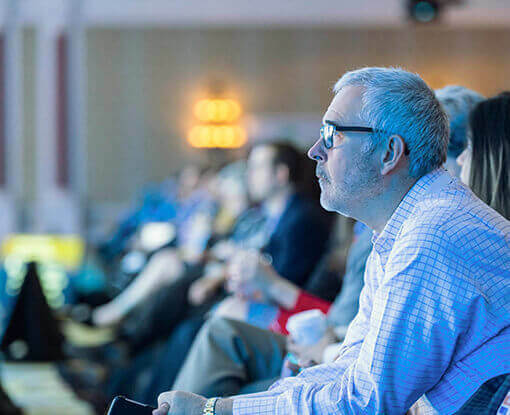 At the Gartner 2019 CSO & Sales Leaders Conference, you will have the unique opportunity to learn from the most progressive sales organizations and from Gartner’s cutting-edge insights into customers, sellers and the best sales leaders’ practices. Join us in Las Vegas to dive into the latest Gartner research, peer insights and methodologies to build a successful sales team of the future. Much of the sales process happens before sales reps get involved. Key account management success isn't won or lost at the individual level. What challenges were you facing that led you to seek support from Gartner? When I first started looking at the Gartner resources, I was new in my role and had come into a company that was growing but perhaps not as strategically as they wanted to be. What we knew is that we wanted to build a professional sales and marketing organization and we wanted to go looking for help and decided to partner specifically with Gartner for that assistance. How did Gartner help you with this initiative? One of the analysts helped us identify that we had a combined program for account management and sales and that the research had shown that they were, rightfully so, allocating all of their time to service and to retention and not enough time to growth. And so working with that analyst crew, we were able to go through a series of tools and actually reorg the department in order to build out a separate sales team, which led us to some really strong new growth numbers as well as retaining and growing the current clients. Have you seen a return from working with Gartner? Well, this year our sales growth is up 20 percent, so I certainly think that the changes in our organizational structure and the support that we got from Gartner is a part of that. How does Gartner help you address your critical priorities? One of my favorite resources through the Gartner relationships is actually the in-person meetings for the leadership groups. So getting to be in a room with 20 or 30 of my peers listening to the research and then talking that through with other individuals who are going through similar challenges is really valuable to me. And then following that up with the one-on-one interactions with the analysts and being able to ask questions and sift through the research individually has been tremendous at making sure that we could execute after the good ideas were surfaced in the room with the peers. I think the largest challenge for us is to wade through all of the myriad of systems and enablement products that are out on the market and try and determine which ones are actually going to be the most useful to the sales team without overwhelming them. We've been able to make direct contact with some of the analysts and be able to have conversations both about the software and the enablement piece as well as about where we're going with different initiatives. So for example, on our account based marketing, we've had multiple conversations about how to hone that better, how to spend less and get more impact. What specific initiatives has Gartner helped you address? The specific initiatives that Gartner has helped me address have been revolving around account-based marketing as well as our growth within existing accounts. So we've connected with the analyst on a couple of different – both software- and process-related issues that were helping us with a challenge we had specifically around trying to hone in on the best solutions for the most reliable cost. Why were these initiatives a priority for your organization? So the initiatives are significant because we're a $6 billion company who have been in our business for about 80 years, but we need to have much deeper penetration into our existing customer base, so the idea of enabling our sales reps to get deeper and an understanding of how to connect with the multiple buyers within these organizations to help us just grow out the business without having to do it always on new logo. How did you envision Gartner would help with this initiative? The assistance we were looking for from Gartner for the initiatives primarily revolved around trying to tie together specifically software solutions along with the process that we were engaged in. So we were engaged in some of the processes ongoing because we're always trying to grow out our customer base and penetrate deeper into our existing customers, but trying to wade through everything that exists out on the market in terms of software for enabling that, Gartner helped quite a bit in bringing those two pieces together. How has Gartner had an impact on this initiative? The interactions with the Gartner analysts have been set up through our account manager specific to issues that we've brought up and discussed with them in the past and/or what are our current challenges and issues. They've been able to bring us insights that we wouldn't have had otherwise about broader based industry and other customers' experience. Why Gartner? Well, so why Gartner pretty much we've been a CEB client for quite a while. The partnership and the merger has now taken place. We worked with Gartner, obviously, in the IT space, more around software and tech-related issues, so bringing those two pieces together, I think is critical for the organization because you shouldn't really lead with software. You should lead with what you want to get accomplished, but I think having those two pieces now together in the Gartner relationship is critical for us to move forward with the right solutions to support our processes that we wanna move forward with. In my role over at BASF, I'm basically an internal consultant. So within the United States, we're in a dozen or so different businesses, all different shapes and sizes, all different types of challenges and opportunities, some with very short sales cycles, some very large ones, some people selling large automotive OEMs with very large deals, long periods of time, some people focusing with local farmers, body shops, things like that. So I am frequently called by sales leaders around the organization to speak to them about what some of the challenges are facing their teams and then design, facilitate a session so I can go work with them and work with their sales force on in order to address those challenges. How does Gartner help you address your challenges? I think that one of the key ways that I've been able to really effectively work with Gartner, where I value the resources that you bring to the table, has been a number of areas. One is the access to the analyst, and that could either be my getting onto the phone with them, you know, when I have a specific problem to solve, trying to work through the best practices that Gartner have developed and trying to figure out how to apply it but also in some cases, bring them into the meetings where they're actually sitting and basically presenting to the sales representatives what we're seeing, what the trends are and how it's gonna impact sales and the industry going forward. And I've been impressed by the fact that if we have some sales representatives that have been around for 15 or 20 years, rather than these individuals sitting back saying this is all academic and it doesn't mean anything to us, these people actually haven't been out there into the field, I'm actually finding that the way that Gartner's analysts are presenting the information and the way they're interacting has been a way to really engage a lot of our even most seasoned professionals for them to be open to the information and, you know, leaning forward in their seats rather than shutting it off. Why did you choose Gartner to help address your challenges? In terms of how I thought that Gartner could help when I started working with you is that I'm basically, I don't wanna say a team of one, but you know, there's very few people who focus on sales excellence within the organization. Back earlier in my career, I spent a lot of time in management consulting, so there were always peers who I'd basically be able to bounce off of these best practices and a lot of these types of concepts. So in some ways what I've done is I've moved to a situation where it's been a little bit more independent where I'm out there supporting multiple field forces and different sales organizations, and when I need to really sit back and say, you know, what's really happening to other companies, what really are some of these best practices, I'm developing the relationship – same relationships in the past I would have had with some of my consulting colleagues, I'm now having with some of the Gartner analysts. How has Gartner impacted your career personally? In terms of how it's impacted my career, I think it's – I think my relationship with Gartner has really allowed me to expand the value that I bring to my organization. So there'll be times when I'm asked to come in and work with a sales organization where I have plenty of experience and plenty of background to fall back upon, but there's also areas where, you know, I'm just self-aware enough to know that I don't know what the best practices are and I don't know what the latest thinking is. So the ability to pick up the phone or to go to one of your portals and have access to a lot of that best practice type information and insights and for me to be able to take that and present it to my internal clients, I think that's really helped in terms of, you know, the value that my internal customers feel that I bring to them and lets me act more broadly in that sense. What sets Gartner apart from comparable services? I think that one of the things that sets Gartner apart from other research organizations or consulting firms – or actually I'd say there's a few things. I think the first one is a lot of the research and tools are very pragmatic. Tends to be based on research that you've – where there's examples from other companies that have actually put it into place, there's a lotta toolkits that we could just take right outta the box and start using, so it's things where I don't really need to translate from theory to basically being pragmatic. I think the second thing, and probably almost more valuable, is – and no insult to other consulting firms – I have a very collegial relationship with the Gartner analyst. So they're not coming in in a very professorial type of way to be able to preach where this is the answer. It tends to be more conversation, it tends to be more dialog, they're open to me challenging them back and forth. And so that type of give and take is, I think, one of the things that really sets Gartner apart. Today we have so many challenges with the customer buying process, that our account planning has to be crystal clear, has to be consistent across the organization and has to be efficient. How has Gartner helped you against this initiative? One of our number one challenges that Gartner helped us out with this year was assessing our account management team. We just recently conducted an account growth assessment with executive director, and that helped us identify skills gaps with our account management team and really helps us fill those in to drive growth. How do you use Gartner on a day-to-day basis? One of the things that's been very beneficial for Black Box is getting our senior leadership team to understand the whole selling process. There's a lot of tools provided to us through our Gartner membership that allows me to educate my peer group very quickly. Gives us a lot of data analysis and analytic tools. Makes it very easy. They can watch one-hour videos and get up to speed on a lot of the things that are going on in the sales process. What makes working with Gartner different than any other company? Working with Gartner is different than many of our other partnerships. They really have a vested interest in our success. If a colleague told you that they were considering using Gartner, what would you say? If a colleague asked me to recommend Gartner, I would almost not even know where to begin. There's so many tools, assets and analytic capabilities of the platform that it's very hard to put into words. Gartner makes me look like a genius.